My path to the forge started by becoming a farrier in La Mancha, Central Spain, just outside the city of Toledo. Eventually I found myself working in Newmarket (Suffolk). After my knees called it quits for shoeing horses, what once was a hobby is now a fulltime occupation and my transformation from Shoeing Smith to Bladesmith is complete! 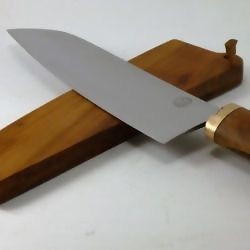 I forge my knife blades in High Carbon Steel, either as monosteel (one single piece of steel) or as Pattern Welded (multi-layered ) also known as 'Damascus' steel. Wood is my preferred material for handles and I source them locally, in general, from pruning.